I like to think of myself as a relatively happy, optimistic person. I haven’t always been that way, but throughout the past few years, I have grown closer to God and really noticed a difference. Looking on the bright side of things and having a glass half full attitude does wonders for my soul. It’s such a better way to live life. Of course there are times when I get upset and am not so smiley. Greg can attest to this more than anyone. He can handle it though. That’s why I have him around. 1. You remember how we moved recently, right? Well I quickly discovered that at 8:15 every morning, right when I’m leaving for work, the sun shines through onto our street just perfectly through the trees so that for about five seconds of my drive I am absolutely BLINDED by the light (sorry for just writing the longest sentence ever). I seriously cannot see a thing for those few seconds, and it’s while I’m driving along a curve to make matters worse. Every morning I’m praying that there’s nobody in the road or a car coming from the other direction. It’s so dangerous, but there isn’t anything I can do. Sunglasses on, visor pulled down…I still can’t see anything. I get so angry at the sun during that time. Sorry, Sun. I love you, but I don’t always have to like you. 2. When people have the car blinker on when they aren’t actually trying to change lanes or turn. I know it happens to everyone, myself included, but it still drives me crazy. I just want them to TURN IT OFF! I can’t wait to get around the car so I don’t have to see it flashing unnecessarily anymore. 3. Wind. I have long hair. I like to wear it down sometimes, is that a crime? The wind thinks so. And with that, I’m off to yoga to fight off these negative energies (well, I actually already went to yoga, but originally typed this post early this morning beforehand). 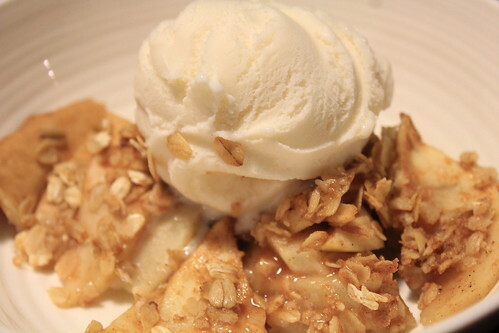 Another solution to put yourself in a good mood: Make this apple pie, add a big scoop of ice cream and just see if you can keep a smile off your face. I bet you can’t. Take that, negative energy! 1. 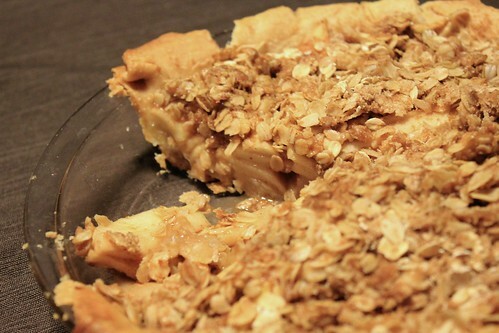 Roll out the pie crust and lay in 9-inch pie pan. Press down around the sides of the pan and trim any crust hanging over the sides. Place in freezer for about 30 minutes. 3. In a large bowl, combine sliced apples, sugars, flour, cinnamon, nutmeg and lemon juice. Stir until well combined. Pour mixture into pie crust and set aside. 4. In a bowl (I use the same one used for the apple mixture to reduce clean up), add oats, brown suga, flour, cinnamon and salt. Stir well and shake over top of the apple mixture in the pie pan. Distribute butter pieces evenly on top. 5. Bake for 40-50 minutes. Be sure to check on pie after 20 minutes of baking – cover with foil if the crust is becoming too brown for the remainder of bake time. 6. Remove from oven and let cool 10-20 minutes. 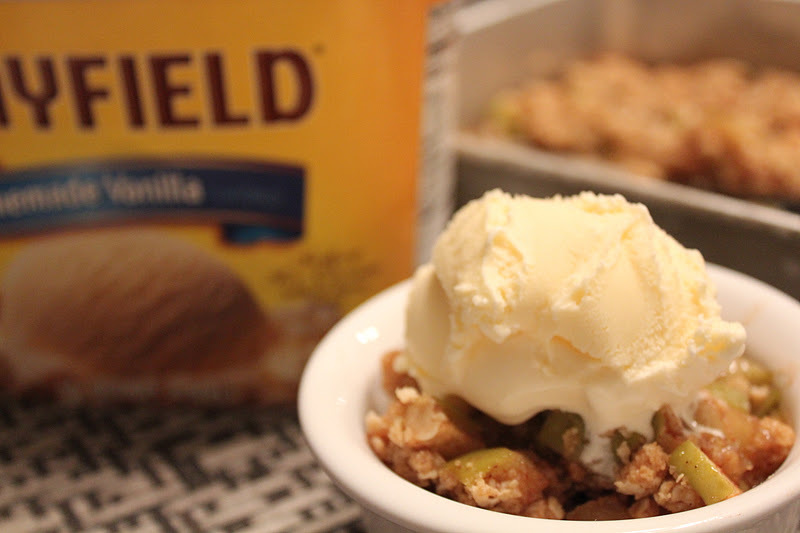 Slice and serve with a BIG scoop of vanilla ice cream. Welcome to 2013! I hope you all had a fantastic New Year celebration. I kept things super low-key on New Year’s Eve by staying home and making dinner for my sister and me. We watched a movie then turned on Ryan Seacrest to watch the ball drop. A small glass of champagne later, I was passed out. I’m not one for making New Year resolutions. Instead, I like to continue to simply do the best I can each day, taking one day at a time. Sure, things (aka eating and exercise habits) get a little out of control over the holidays and it feels good to restart, but breaks from a more healthful routine are all part of it. I know this isn’t the first day of the new year, but this is my first post. 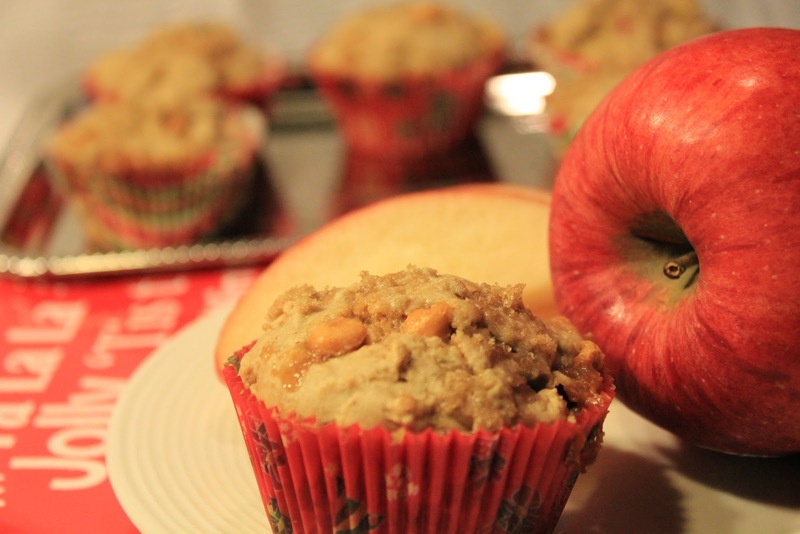 For that, I bring you my favorite muffin recipe to kick 2013 off the right way – a sweet muffin filled with some healthful fruit! Salt and pepper. Bread and butter. Milk and cookies. 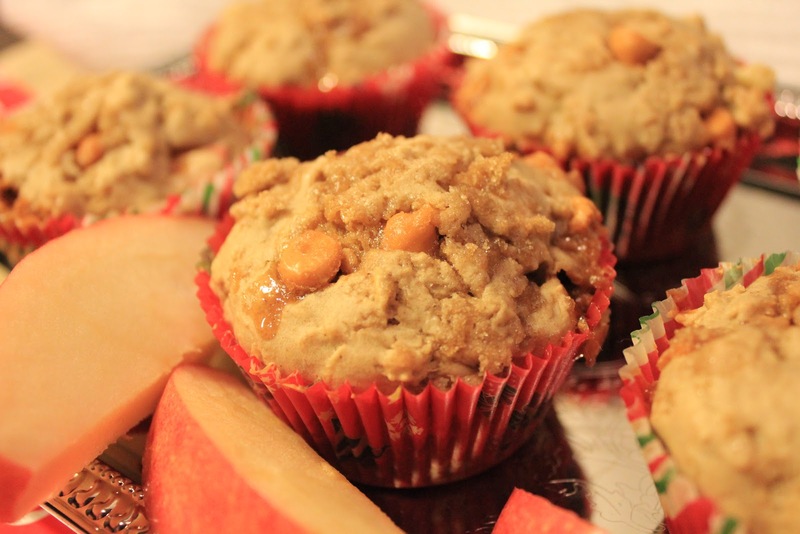 It’s not a cupcake or made with chocolate, but something about butterscotch and apples just works. 1. Preheat oven to 350 degrees. Fill cupcake tin with paper liners and set aside. 2. 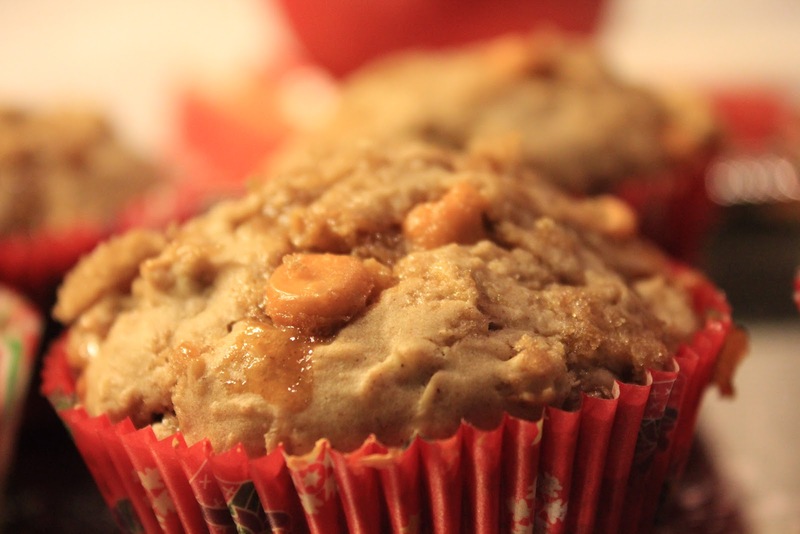 In a medium bowl, add flour, baking powder, baking soda, salt, cinnamon and oats. Whisk to combine. 3. In the bowl of a stand mixer, add butter and sugar and blend until creamy. Beat in yogurt, applesauce, eggs and vanilla until well incorporated. While continually beating on low speed, add the dry ingredients to the mixture, alternating with the milk. 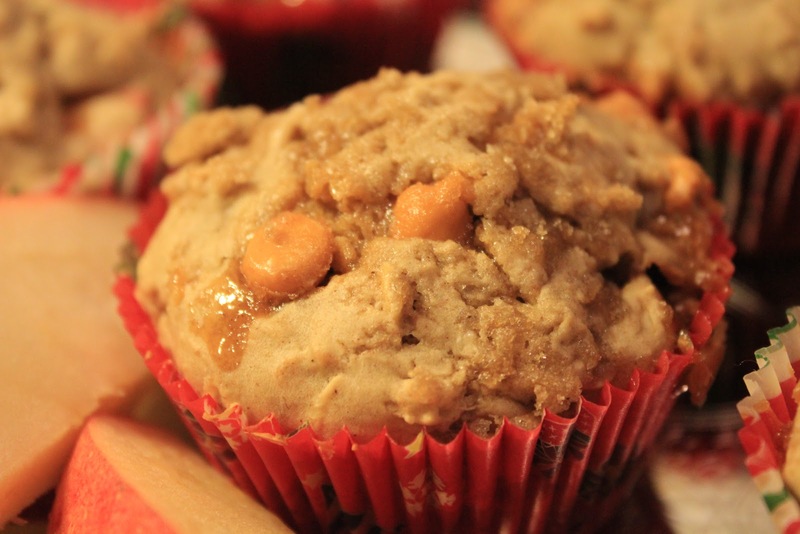 Fold in the butterscotch chips and chopped apples. 4. Divide batter among cupcake wells. Bake 18-20 minutes or until toothpick inserted in the middle comes out clean. Let cool about 5-10 minutes before transferring to a wire rack to cool completely. What is one breakfast you just can’t live without? Mine would have to be oatmeal. No matter how much I love pancakes, french toast, cinnamon rolls and doughnuts, oats plays a vital role in my diet. Ok, to be honest I couldn’t live without pancakes and doughnuts either. But I only indulge in those every once in awhile, and eat oatmeal almost daily. Or, just combine the two and get oatmeal pancakes! For several months now my weekday breakfast has consisted of a bowl of hot oatmeal with almond milk, cinnamon, chai seeds and sliced banana. Not even kidding, I have probably had this about 80% of the time since the springtime. What can I say? I’m a creature of habit and love a good routine. 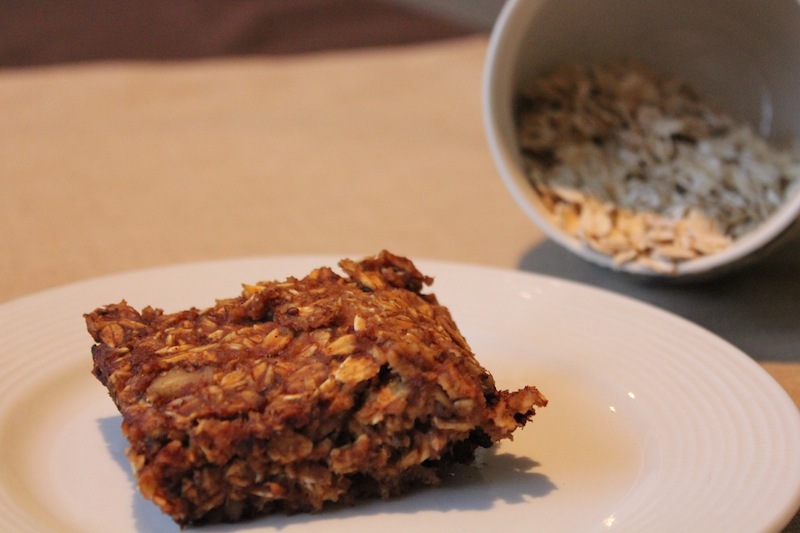 It doesn’t hurt that oats are full of health benefits. Well, today I announce that my traditional bowl of oatmeal has some stiff competition in the form of a baked oatmeal loaf. 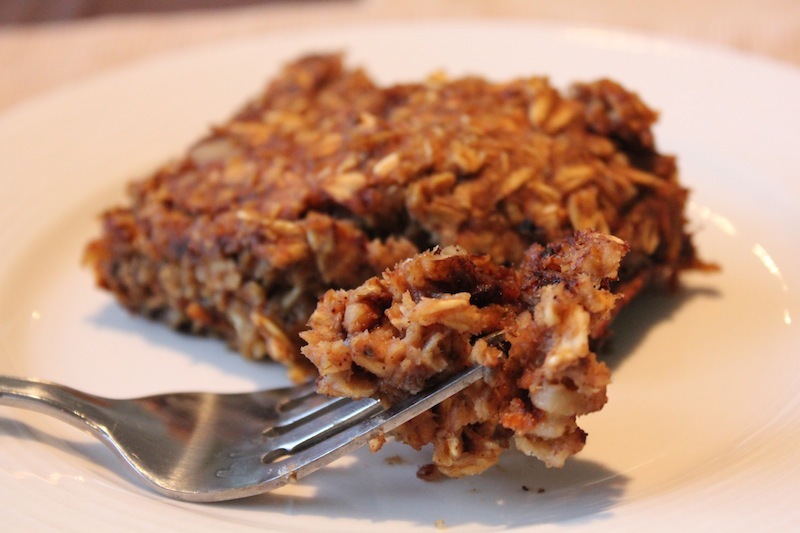 Thick, hearty and full of both texture and flavor, baked oatmeal may be my new favorite discovery. I realize I have a lot of ‘favorites’ that I share with you from day to day. I’m not exaggerating with this one though. 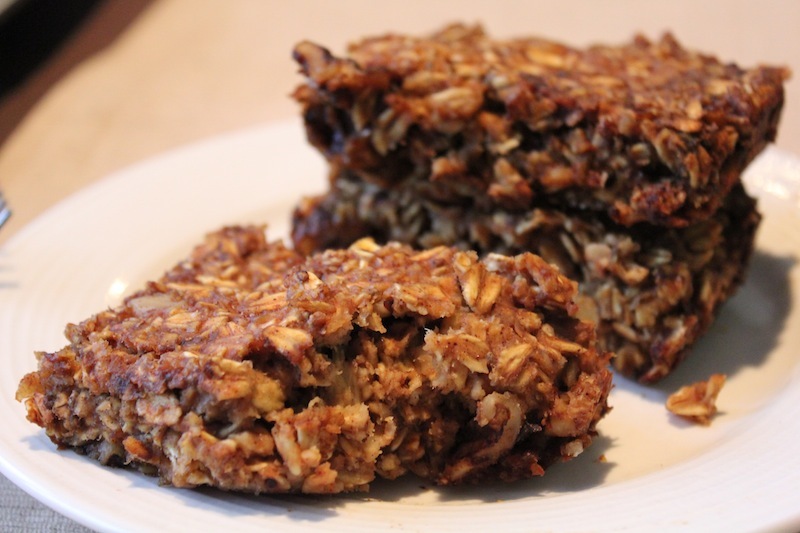 Next time your craving the warmth of oatmeal and have a little extra time to let it bake, rather than nuke in the microwave, try this. You won’t be disappointed. 1. Preheat oven to 350 degrees. Spray small loaf pan with cooking spray and set aside. 2. 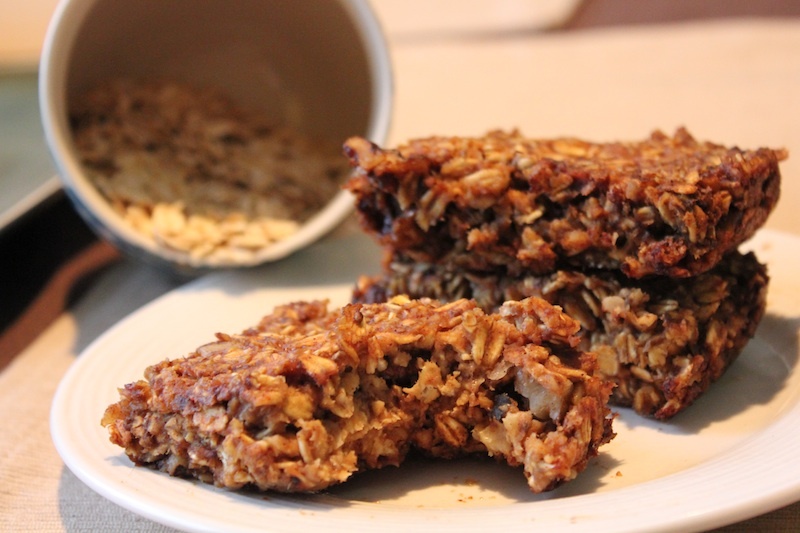 In a medium bowl, add oats, chai seeds, brown sugar, salt, and baking soda. Whisk thoroughly. 3. In a separate small bowl, add applesauce and apple butter. Whisk until well combined. Add to oat mixture and whisk or stir until all ingredients are well incorporated. Add walnuts and stir to evenly distribute. 4. Pour mixture into loaf pan and gently press down with a spatula to form an even layer. Drizzle almond milk over the top. Bake for 10 minutes. Remove from heat, stir, and press down again into an even layer. Bake 8-10 more minutes (oats will become medium-dark golden brown). Remove from oven. Let cool in pan up to 5 minutes. Slice into pieces and serve immediately. Top with syrup if desired. Well, that is if you can call a Monday morning ‘good.’ You know what though, life has been great recently so I really can’t complain. After the apple cobbler dessert from the cooking class Greg and I took this weekend, we were craving some more apple goodness. I have been stock piling recipes for so long now that before I looked up another one, I wanted to knock out one from the list. After just a couple minutes of recipe skimming, I found the one. I already had all ingredients on hand, although now my apple-snacking addiction will have to suffer for a couple of days until I make it back to the grocery store for more. Again, I really can’t complain. 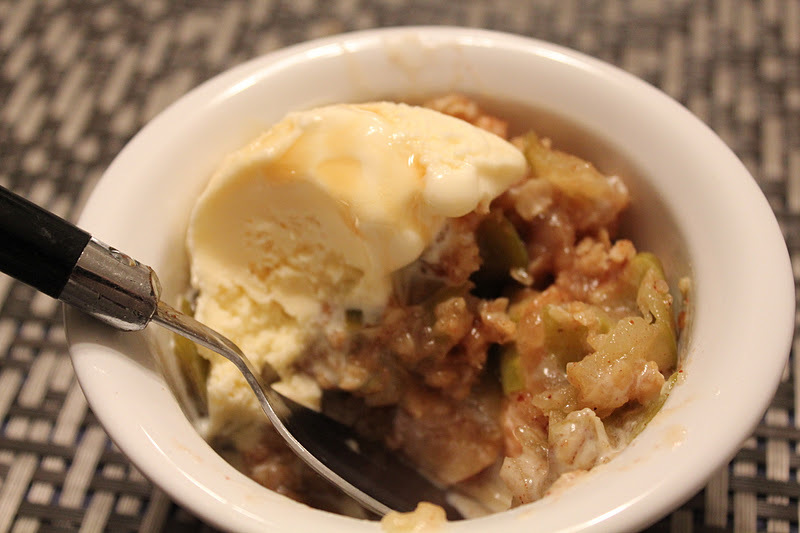 As much as I love cold, crisp apples, when they are warm, cinnamon-y and topped with ice cream they are even better. You could make this with pretty much any other fruit…blueberries, blackberries, peaches, or a combination of a few. Something like this would turn that Monday morning frown upside down in a jiffy. 1. Preheat oven to 350 degrees and grease 8×8 inch baking pan. 2. In a medium bowl, make the base by combining sugars, flour and cinnamon. 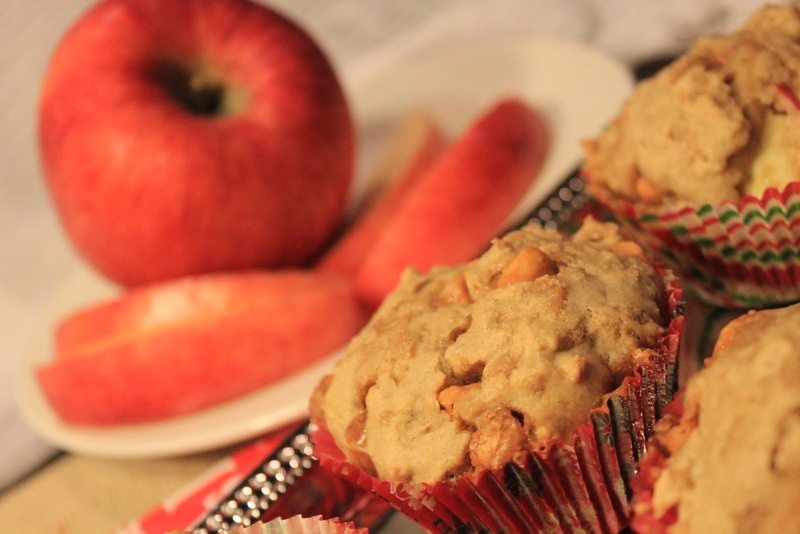 Add diced apples and toss all ingredients until apples are evenly coated with dry ingredients. 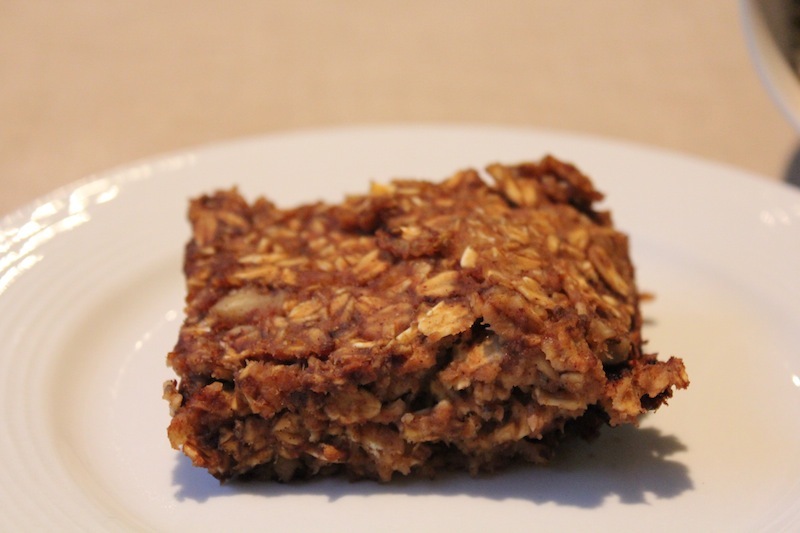 Pour apple mixture into baking pan in an even layer. 3. In a separate bowl, combine first four ingredients for the topping mixture. Mix melted butter and vanilla then pour into dry ingredients. Mix together with a fork until all ingredients are moistened. Crumble topping mixture over the apples in the pan. 4. Bake for 25-30 minutes. Remove from oven, let cool about five minutes, and serve warm with a scoop of vanilla ice cream. Drizzle with caramel sauce if desired. A few months ago I was introduced to the cheese and apple combination. Now that I think about it, I always knew the two went well together. Cheese plates are often served with fruits like apples and grapes. And I love a good cheese plate (wine required). I was pleasantly surprised when I tried the sandwich for the first time, but kind of forgot about it until yesterday. I didn’t have any regular bread in the house, but did have Arnold Sandwich Thins. I love those things by the way. So that was the first variation. The second? 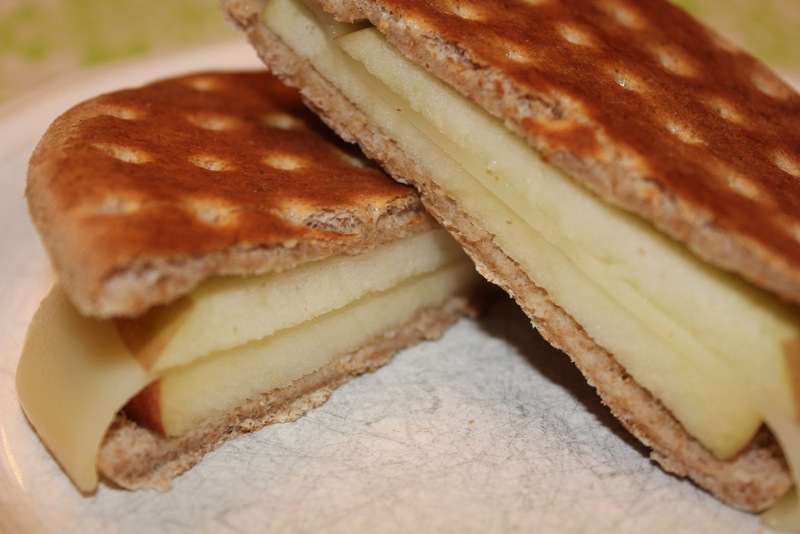 I have been dying for a grilled cheese sandwich, and thought a grilled apple and cheese sandwich would be just as good! Well, I was only partly right. It was good. But I liked it better on normal sandwich bread. Sandwich thins don’t toast as well. As much as I love them, they are best left in their natural form. I also used provolone cheese, when cheddar is really the way to go. I knew this instantly after my first bite, so I jumped up from my seat to grab the cheddar and tucked some inside the sandwich. The cheddar helped liven up the sandwich, in flavor and color. And we all know how important it is for the food to look pretty. I really liked the combination of different cheeses, rather than just one over the other. Unfortunately, I was too hungry to get this cheesy model back in a presentable condition for photographs. I ate her without giving her a second chance with the camera. It may not look like anything fancy, and it’s not, but if you need a light, simple sandwich to throw together, this is a good choice. 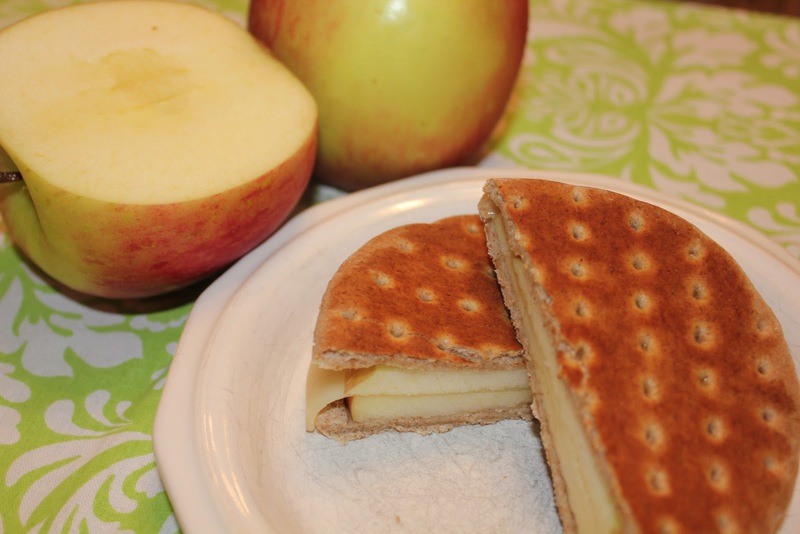 Have you ever made grilled apple and cheese sandwiches? Are there any other ingredients that go well with them? 1. Heat skillet over medium heat. Spread butter on one side of each slice of bread. 2. 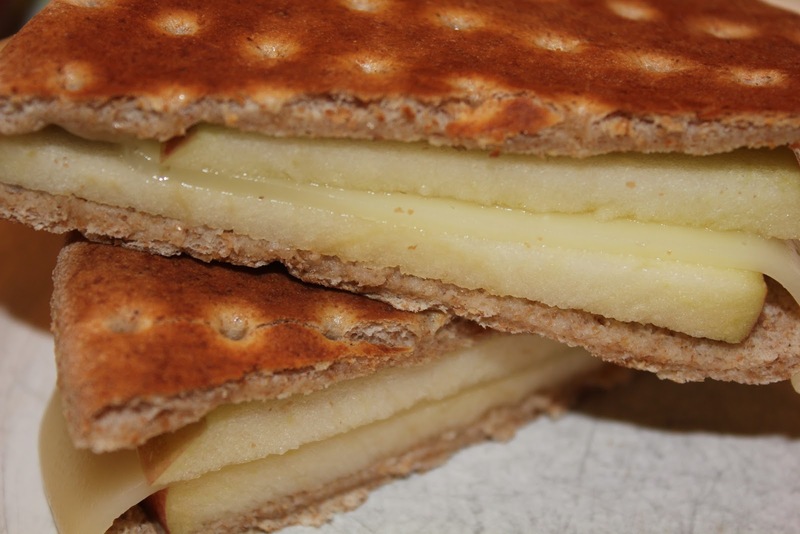 Place one slice of bread, butter-side down on skillet and top with cheese and apple slices. Lay other slice of bread on top, butter-side up. 3. Cook 1-2 minutes. Flip sandwich and cook another 1-2 minutes. 4. Remove from heat and serve warm.